OnMobile Global Ltd (BSE: 532944, NSE: ONMOBILE) counters in NSE & BSE, on Monday, witnessed hectic activity as Goldman Sachs and HDFC Mutual Fund bought significant stakes. The deals were disclosed at National Stock Exchange and Bombay Stock Exchange after trading closed on Monday. Goldman Sachs Investments Mauritius I Ltd bought 12 lakh shares at Rs. 29.59 a share, while HDFC Mutual Fund picked up 7.05 lakh shares at Rs. 29.62 per share in this leading telecom/mobile value added services (VAS) player. However, heavy institutional selling continued in the counter on Monday with the FII, Smallcap World Fund Inc, selling 7.60 lakh OnMobile Global shares at Rs. 31.11 a share. Earlier, on Friday, this US based fund belonging to the leading MF, American Funds (Capital Group), had sold off 48.18 lakh shares. It is likely a full exit by this FII from OnMobile. Monday also witnessed two financial institutions selling heavily in the OnMobile counters in NSE & BSE. While Kotak Mahindra Prime Ltd offloaded 28.80 lakh shares in NSE at Rs. 30.24 a share, and 6 lakh shares in BSE at Rs. 29.65, Birla Global Finance Company Ltd sold off 13.80 lakh shares in NSE at Rs. 29.42 a share. The massive sells by these two domestic financial institutions appears to be liquidation of pledged shares. On Monday, Kotak Mahindra Prime had disclosed in the exchanges that 12 lakh more shares were pledged with it on Friday, taking its tally of pledged shares to 67.44 lakh shares. OnMobile Global stock had been on an accelerated fall in recent months, continuing a long-term downtrend. The fall in past week has obviously triggered margin calls from these lenders which were not met by the promoters who had pledged the shares. Apart from the sell by Smallcap World Fund, the stock had witnessed significant institutional churn last week, with Birla Sunlife Trustee Company selling 8 lakh shares on Thursday, and Barclays Capital Mauritius Ltd buying 7.28 lakh shares on Friday. Obviously, different institutional investors are taking contrasting calls on the impact of the serious corporate governance issues that have surfaced at OnMobile Global in recent weeks. News reports had said that the company’s Board of Directors is probing fund misappropriation by Arvind Rao, its Co-Founder, Managing Director, & former Chairman & CEO. While this development has prompted its largest non-promoter investor, Smallcap World Fund, and fourth largest investor, Birla Sunlife to cut their positions drastically, new investors in the counter like Barclays, Goldman Sachs, & HDFC MF have surfaced to take advantage of the sharp fall in prices. OnMobile Global has largely denied these allegations, even while it admitted that an external consultant has been appointed to look into certain corporate governance issues. This consultant is said to be KPMG, which had started a wider audit in December, after which Arvind Rao stepped aside as Chairman and HH Haight, an early investor in the company, took over as Chairman. During June beginning, a two-member committee of the Board, including Haight, took over running the company, from CEO Rao, who is now heading international operations. In its recent rebuttal of allegations, OnMobile Global has stressed that Arvind Rao remains the Managing Director, and that the recent resignation of Sandhya Gupta as Head M&A is for personal reasons and not due to an adverse probe against her. However, the argument is difficult to digest as the company has changed its CFO too, thrice within the past three quarters. OnMobile Global was incubated in the US arm of Indian IT giant Infosys, and had its early and significant backer in Argo Global Capital, led by HH Haight and other partners. Argo is a unique family of telecom focused venture capital funds, that draws one-third of its funds from leading telecom operators like Deutsche Telekom, France Telecom, & Singapore Telecom, and the remaining two-thirds from institutional investors. Unlike many other VCs, it takes a proactive role in getting business for its portfolio of telecom startup companies, through its connection with leading telecom operators. In the listed OnMobile Global Ltd, Argo’s stake is likely held solely through the largest promoter group company, OnMobile Systems Inc which holds 35.22% of the 49.29% promoter stake. 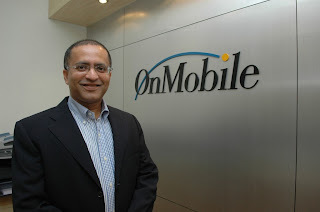 Arvind Rao directly holds 6.65% in Onmobile Global, while another co-founder, J Chandramouli, holds 3.88%. Much of Rao’s holdings are pledged with financial institutions, and is likely the source of the fire-sale seen recently. On the fundamental side, OnMobile Global had a poor Q4, with consolidated net profit falling to nearly one-fourth on a year-on-year basis, even though it managed to close FY’12 with a flattish bottomline. On Monday, identified large-sells in OnMobile Global were thrice as large as identified large-buys, and the stock closed down by 3.28%, at Rs. 29.45 in NSE. Yet, investors in the counter will be keenly watching for a rebound as institutional investors like Barclays, Goldman Sachs, & HDFC MF have taken up significant positions. Obviously, much will also depend on whether selling pressure will continue from financial institutions that possess pledged shares, and from large institutional investors in the counter like ICICI Prudential, Amansa Investments, Birla Sunlife, Dragon Peacock Investments, & Veritable LP.